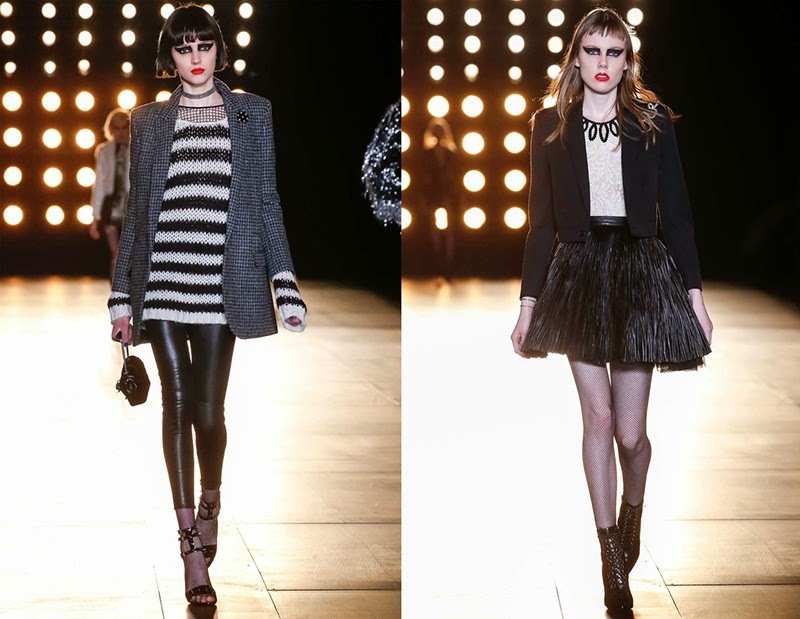 "The clothes for fall are as they have been since Slimane took the creative reigns here in 2012. They tap into a moment in music history. This time it is punk. His gang of models stomped down the runway — which rose from the floor on what appeared to be some sort of chain and sprocket system — wearing black leather motorcycle jackets, leather leggings, lampshade mini-skirts with stiff crinolines, shredded stockings and Technicolor furs. There were tight minidresses in black with metallic shimmer. They bared one shoulder, some adorned with a single giant bow, colorful waist details or nothing at all. 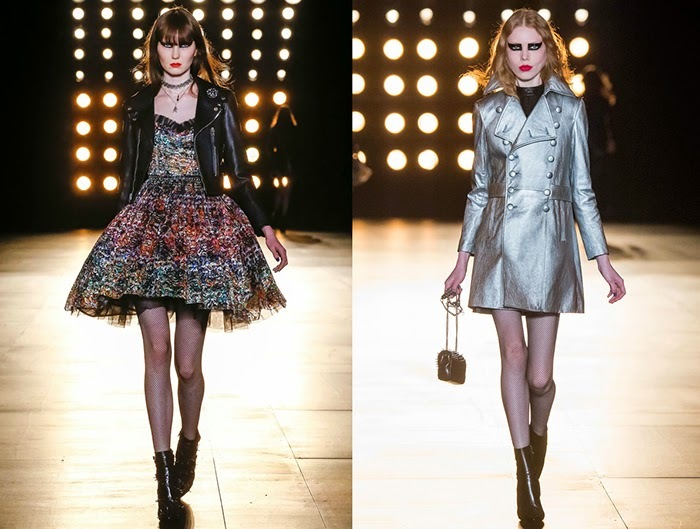 Slimane loves a rock-and-roll homage, and he has transformed pieces of that vernacular into classics within his collection. Time and again, he offers car coats and minidresses, skinny pants and sharp-shouldered blazers. The fabrics and embellishments change, but the silhouettes remain the same. The aesthetics of Saint Laurent are boozy and sweaty. The clothes do not look expensive on the runway although they most certainly are in stores. There is a certain wanton, tawdriness to them. They reek of rebellion and ennui. Today, fashion aims to offer a modest aura of cool, a palpable connection to contemporary culture and ease. Luxury has become a perfect white T-shirt worn with wash-and-go hair. There is nothing evidently intellectual about Slimane’s work. It shouts and rages, curses and moans. His models, with their dark eyeliner and wild hair, stomped down his runway practically breathing fire. His women don’t want to get lost in their head. They don’t want to overthink or parse. 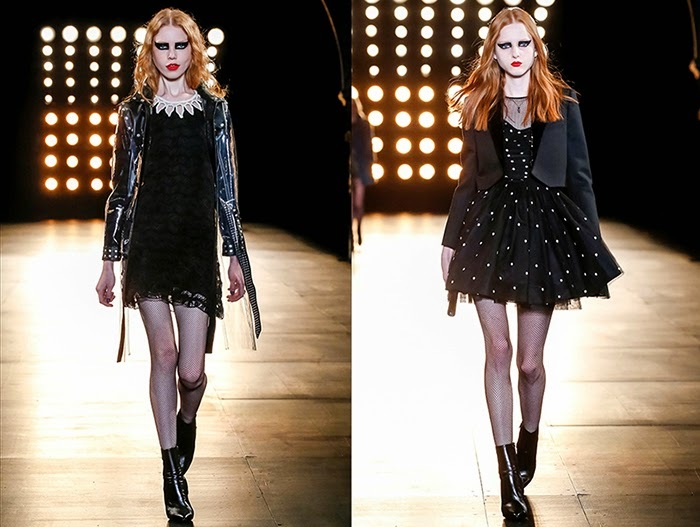 Slimane has defined modern luxury, in part, as the ability to break free and not care. At a time when everyone is pulled in countless directions, who wouldn’t want to turn away? Slimane’s work taps into that desire and then some. There’s no walking away. There’s no retreat. The collection leans in close. And yells." 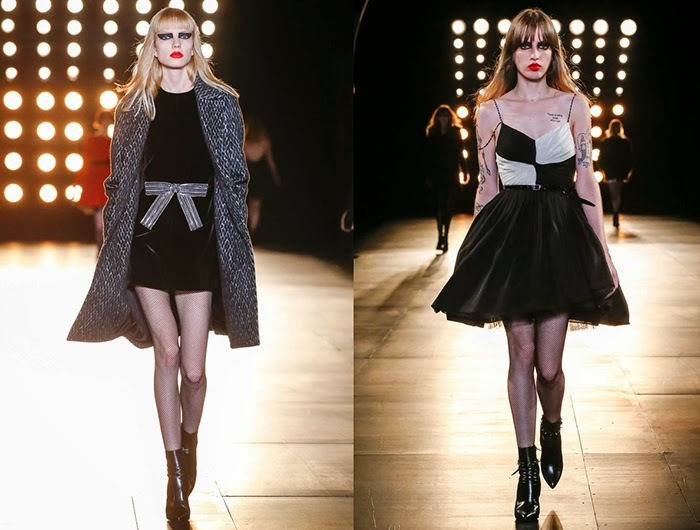 MUSIC FROM "MYSTERE", WRITTEN AND COMPOSED IN BRITTANY FOR SAINT LAURENT "PARIS SESSIONS" SHOW. "ME SUIVE" WAS WRITTEN BY MARLON MAGNÉE, SACHA GOT AND SAM LEFÈVRE FOR "MYSTERE" COLLECTIVE.